Godzilla Premium is the first of four trim levels. The refreshed Nissan GT-R is on its way. The latest model receives a nip/tuck, gaining a larger grille, a new hood, and a refreshed interior. 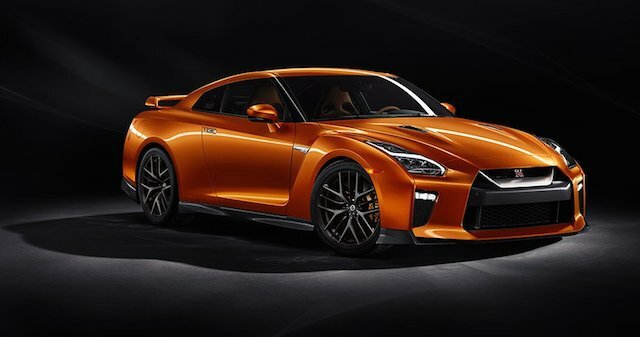 The standard-bearer model is the GT-R Premium, outfitted with a Titanium exhaust system and is also the beneficiary of a 20-horsepower boost in performance. Introduced to the US market in 2009, the current GT-R has served as the halo model for the Nissan brand since. We have also seen this model’s price surge from $70,745 in 2009 to $109,990 for 2017. That’s nearly $40,000 added over the years for a vehicle now in its ninth model year. The GT-R’s lofty price is well above the Chevrolet Corvette Z06 ($79,400) and the Porsche 911 ($89,400), two competing models. Nissan sells just 100 to 150 models per month with its exclusivity driving the pricing trend and perhaps justifying the $8,220 increase over the 2016 model. Nissan says the improvements on this all-wheel drive sports car focuses on five areas: exterior design, interior refinement, driving performance, ride comfort and advanced technology. Up front is a new V-motion grille, enlarged for the sake of delivering better engine cooling. It now comes with a matte chrome finish and a refined mesh design. The new hood features pronounced character lines moving seamlessly from the grille. Moreover, the grille has been strengthened to reinforce stability during high speed driving. Blaze Metallic is the lone new exterior patina added for 2017. Slip inside and you will find that the updated interior design now features an instrument panel wrapped in customized Nappa leather as well as a refined front seat design developed for improved comfort and holding performance. Nissan also simplified the switch layout narrowing the panel to just 11 switches from the previous 27. An 8-inch capacitive touch panel monitor is in place, replacing the most recent 7-inch layout. One change certain to cause debate amongst enthusiasts is the relocation of the paddle shifters from the steering column to the steering wheel. Nissan explained the decision as “allowing drivers to make mid-turn gear changes without taking their hands off the wheel.” If you’ve ever driven a car with steering column-mounted paddle shifters, you know that this decision is a big deal. The interior is covered in semi-aniline leather and provides three distinct options, including the newly added Rakuda Tan. The other choices remain Amber Red and Ivory. Standard for 2017 is NissanConnectSM with Navigation and Mobile Apps and Services, the latter allowing users to manage a smartphone to remotely lock or unlock the car doors, activate the alarm, summon emergency services or track the car if it is stolen. The 2017 models now has a 565 horsepower rating, an increase of 20 horsepower. Nissan claims the 2017 GT-R has a flatter torque curve for enhanced on-demand acceleration. Included among the powertrain modifications is a new Titanium exhaust system – standard on GT-R Premium models – imbued with new active noise cancellation and active sound enhancement tech engineered to eliminate superfluous noise while preserving passion during vigorous driving. Also helping the cause is acoustic glass and targeted sound dampening designed to mitigate the invasion of wind and road noise into the sports car’s cabin. For 2017, the Nissan GT-R is composed of four grade levels. Premium is standard; information about the other three levels will be announced at a later date. So, what do you think of the refreshed GT-R? This six-figure Nissan is unattainable for all but the most deep-pocketed enthusiasts amongst us. Even a used 2009 model in very good condition will cost you about $50,000, keeping Godzilla out of the reaches of most of us. Photo copyright Nissan North America.